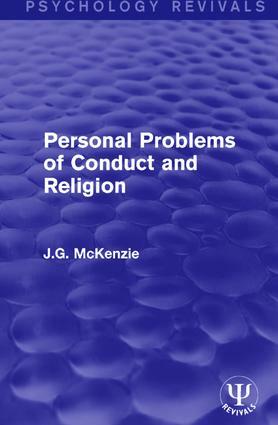 Originally published in 1932, Professor McKenzie, author of ‘Souls in the Making’, had been deeply interested for years in helping those afflicted with nervous troubles, moral conflicts, or religious doubts. Each chapter of this book deals with some concrete problem which he had actually faced with one of his patients. He was convinced that many of the severer forms of neuroticism could be prevented if treated with understanding, and that many a parent could have been saved from making a fatal mistake in coping with a ‘difficult’ child, if they had only been taught to deal with such. The practical character of this book can best be judged by a glance at a few of the topics discussed: ‘An Adolescent Problem’, ‘The Problem of Growing Up’, ‘The Troubles of Old Age’, ‘Psychology of Sleeplessness’, ‘The Delinquent Child’, ‘Our Regrets and Our Fears’, ‘Psychology of Faith’. Preface. 1. Our Immediate Problem 2.The Incomplete Life 3. An Adolescent Problem 4. On Forming New Habits 5. The Problem of Growing Up 6. What Our Young People are Thinking 7. Christ and the World 8. Temptation and Church-going 9. Our Regrets and Our Fears 10. The Troubles of Old Age 11. Psychology of Sleeplessness 12. The Delinquent Child 13. Are We Clay in the Potter’s Hands? 14. Psychology of Faith 15. Does Christianity Need Christ? 16. Christ – Teacher or Lord? 17. God, Prayer and Immortality 18. Why People do go to Church. Psychology Revivals is an initiative aiming to re-issue a wealth of academic works which have long been unavailable. Following the success of the Routledge Revivals programme, this time encompassing a vast range from across the Behavioural Sciences, Psychology Revivals draws upon a distinguished catalogue of imprints and authors associated with both Routledge and Psychology Press, restoring to print books by some of the most influential scholars of the last 120 years.